A “Class of 1963” charter inductee, Carl ”Lefty” Liscombe is the 10th all-time goal scorer (137) in Reds history. He was also a two-time MVP of the American Hockey League. 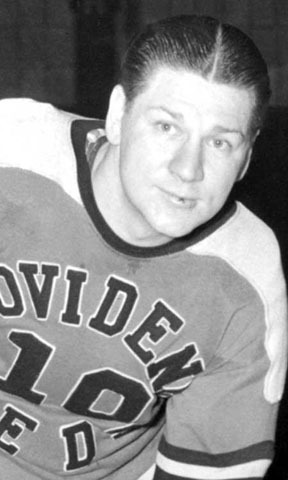 In four seasons with Providence, from 1946 to 1950, the prolific-scoring Liscombe tallied 137 goals, 166 assists and 303 points in only 219 games. In the 1948-49 season, he became the first AHL player to reached the century mark in points when he set the Reds’ all-time single season goal scoring (55) and points records (118). As a NHL veteran of over 400 games played from 1937-1946, Liscombe registered 137 goals and 277 points. Liscombe had the pleasure of winning the Stanley Cup with the Detroit Red Wings in 1942 and, later, the Calder Cup with Providence in 1948.